Birds have taken flight to the Spiral Gallery this month. The title of Connie Athman's show "All A Flutter" refers to both the winged animals and an experience she had earlier in her creative career. When she was starting out as an artist, Athman took a workshop with painter Mel Stabin. He used a phrase she still remembers today. "(He) was so enthusiastic," she recalled. "At the start of his painting, he said, 'I'm just all a flutter.' It stuck with me, and it describes very well the feeling you get when you do something you love, and you see all of the possibilities." 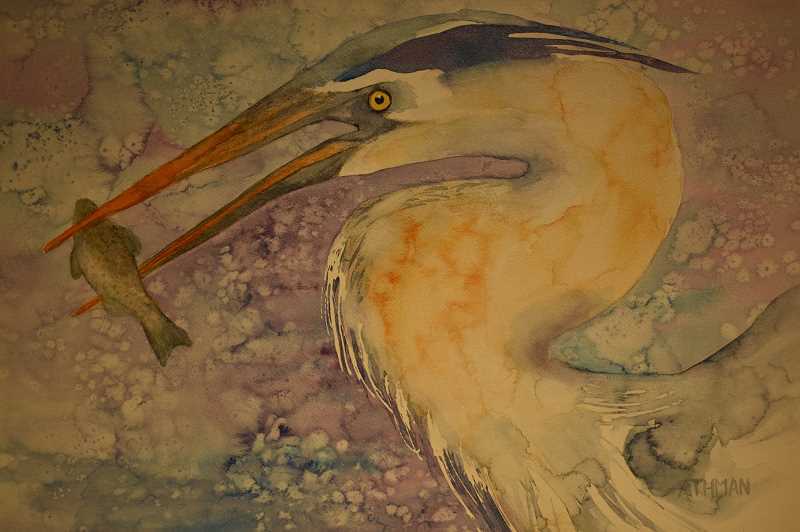 "All A Flutter" will be featured through the end of this month at the Spiral Gallery, 341 Broadway St.
Athman appreciates that no two birds are the same, and she's enjoyed creating watercolor depictions of them. "They are fascinating, and there's so many of them," she said. "I've done everything from hummingbirds to great herons to hawks. It's fun to capture them in art form." One of the pieces in the show that particularly stands out to her depicts hummingbirds. Though the birds are in focus, the rest of the painting is "very fluid and abstract." "I'm really satisfied with it, and I want to do more of that," she said. When making pieces for "All A Flutter," Athman used a variety of materials, including traditional watercolor paper, rice paper and Chinese ink. She also created several paintings on boards rather than framing them. Many of these techniques differ from her usual work, and she's happy to have incorporated them into the show. "I definitely have found things that I want to continue," she said. Athman noted that it's been several years since her last show at the gallery, and she's excited to share what she's been working on with the community. "This is the culmination of my creative path for a few years," she said.